The GenPad™ installs faster and cleaner than a poured concrete pad. Just bolt the generator to the pad and you are done. 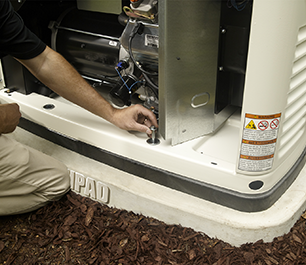 No waiting for messy concrete to dry and cure before installing your generator. Generators will mount securely using bolts and metal inserts built into the pad, keeping it centered on the pad and preventing damage from shifting or moving. The standard GenPad™ is ideal for most residential applications. GenPad Hurricane™ is designed for storm prone areas and is a thicker, heavier pad. © 2015 DiversiTech Corp. All rights reserved.